I started Callum Ewen Transport on 4/04/2016 as a Sub contractor to Tarmac, based at Harper Lane, Radlett, delivering asphalt and aggregate. As of 03/04/2018 I have changed from a Sole Trader to a Limited company and now run under Callum Ewen Transport Ltd. In the last year I have doubled my vehicles and staff and I currently have two Tarmac spec tippers and two employees. I am currently in the process of selling my original Euro 5 Lorry and will be upgrading to an additional Euro 6 Lorry in January 2019. In order to reduce Fuel use, myself and my drivers plan our routes where possible to ensure the most fuel-efficient route is being used. The new Lorry I am getting in January 2019 will be a Euro 6 which is more economical and more environmentally friendly, this has been evident in my newest Lorry which I have been running for almost a year. Myself and both my drivers are very conscious of the importance of reducing fuel, CO2 emissions and NOx. This has been taken into consideration when buying both of my newest Lorry’s, I have considered the impact of the above when making enquiries into my new Lorry to make sure these levels are reduced where possible, the Euro 6 lorries have features included so that the drivers will be more aware of how they drive so that they can continue to reduce these levels, such as the telematics option added, where things such as harsh accelerating and driving style can be monitored. I use the performance management tool that is available through FORS to monitor this. This is evident in that the MPG has been reduced. Myself and my drivers have not received any transport related fines or charges, however with the training and information provided by FORS such as vulnerable road users and safe urban driving through e learning we can ensure that we maintain this and adhere to the best Road Safety practice possible. I continue to undertake training sessions and courses provided by FORS and I became a FORS practitioner in December 2015, I will renew this when due in 2020 . 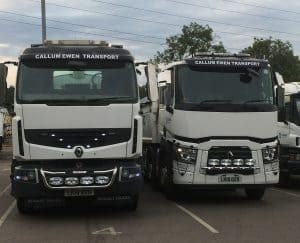 I knew that when I started Callum Ewen Transport and then Limited that it was important to continue adhering to FORS and to maintain my own FORS accreditation as it helps us to continue to achieve best practice and benefit us by providing valuable knowledge and support to myself and drivers. It is also an invaluable recognition of high standard that many contractors are looking for. Achieving FORS Gold in January 2018 showed me that I am complying with the Industry Standards and that I was running an efficient company. I am now eager to maintain FORS. Gold to know that we are running at the highest possible standard and consistently improving our way of working. We have really made the most of the available resources and facilities that come with being registered with FORS such as undertaking CPC classes for Safe Urban Driving and using the driver licence checking tool. I also became a FORS Practitioner in 2015 following attending 10 Workshops including Collision procedures and analysis, managing driver fitness and health, reducing Fuel use and minimising environmental impact. Attending these workshops helped me gain a better undertaking and improved my knowledge to ensure I could incorporate this information into better working procedures. We continue to use the FORS workbooks received during the workshops which are a helpful source of reference. I have found the performance management tool helpful as it produces clear information on fuel usage, CO2 and NOx. The graphs show me clearly how we are running and I am able to use this tool to identify If changes are required. My Safe Urban Driving, Vulnerable Road Users and the e-learning modules all remain up to date. My drivers Safe Urban Driving and MPQC remains up to date, all accreditations will be monitored to ensure these are renewed as required. All of these courses have improved our knowledge and overall improves the way we work. A benefit of working to FORS standard is if improvements are required in certain areas within my company, guidance would be received from FORS during audits to then make the appropriate changes. I ensure the Lorry’s are regularly maintained to ensure that they run as efficiently as possible. Improving the economical running of the Lorry’s was an important factor when I was looking into getting my second Lorry and remained a high priority when looking to replace my original Euro 5 Lorry, as a result I chose a Euro 6 in both cases as they have a number of features that improve efficiency and noise pollution. I continue to use the performance management system to record and monitor our readings. Driving standards are also monitored through this tool and the Tachograph systems. Tarmac encourages all their sub-contractors and drivers to progress through the FORS accreditations and achieve and maintain Gold, I continue to strive to maintain my Gold accreditation because this reflects the High standard of work to which we endeavour to achieve. I have Health declaration forms which have been completed by myself and my drivers and will be completed by any future drivers, I have included the forms used in this portfolio. I also undertake regular eye sight checks with my drivers and encourage communication regarding any health issues. Any health and fitness concerns will be followed up with a GP if required. Earlier this year I recruited a new driver, I have included my processes that I followed to successfully do this. I provide all training required to get the driver confident and up to a high standard. I have a Euro 6 Lorry which is more economical and is overall a quieter vehicle. My newest Lorry coming early 2019 will also be a Euro 6. An example of how we take into consideration Noise and disruption is when we are working on a Residential road at night we turn off reverse beepers and left turn alarms to minimise disturbance. As a company, my plans for the future are to continue to expand, improve and to maintain a high standard by updating and maintaining my FORS accreditations and undertaking future courses available. 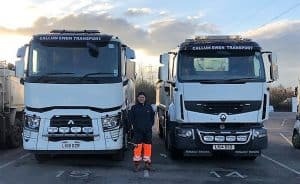 I believe that by working hard and achieving the highest level of FORS demonstrates my passion for my business and wanting to work at the highest possible standard. This also means that I am respected in my field and therefore feel able to make suggestions of improvements and know that my feedback is taken on board.